Sleep issues don’t just suddenly stop when your baby becomes a toddler. In fact, the sleeping troubles faced during the toddler years can be a lot more frustrating and difficult to deal with than they were in the baby stage. From sleep regression to musical beds – there’s a lot of sleeping problems you may face, but one of the most common is a fear of the dark. Most kids go through a phase where they’re scared of the dark. However, it’s particularly common during the toddler stage. So, how do you ease your toddler’s fear of the dark and help them (and you) get a good night’s sleep? 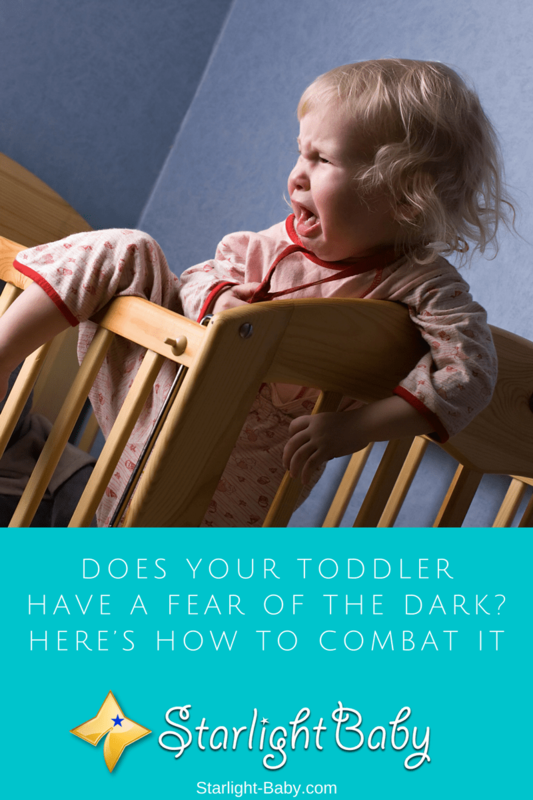 There’s a number of reasons your toddler may be scared of the dark, so it’s important to get to the root of the problem before you can figure out how to deal with it. Mostly, it’s their imaginations running wild. Your toddler is starting to develop an extraordinary imagination. While this is largely a good thing, at this age they aren’t able to establish the difference between reality and fantasy. So, if they start to think of scary monsters, in their mind these monsters are real and very much something to be afraid of. However, it isn’t always imagination which causes a sudden fear of the dark. It could also be down to sudden changes in their circumstances. It could be you have recently split up with your partner and they’re no longer around, or it could be a new babysitter or a recent move. Toddlers find it really difficult to adapt to change so if there have been any changes in their routine, it could cause them to have more trouble sleeping. It’s also worth noting that some children are naturally more likely to be afraid of the dark than others. If your toddler is quite sensitive, they may have an increased fear of the dark, as well as being alone at night. In this case, the fear of the dark may never go away and could even last through to adulthood. In order to determine why your toddler is afraid of the dark, the best thing to do is to talk to them about it. Ask them why they’re scared and this will give you the best idea of how to approach the problem. So, you now know why your toddler is afraid of the dark, but the real question is how can you deal with it? Below, you’ll discover some of the best tips to help ease your toddlers fear and encourage a better night’s sleep. Ok, so there aren’t any real monsters lurking around, but good luck getting your toddler to believe that! While explaining monsters aren’t real is a good first step, it’s not really going to prove effective on its own. Instead, helping your toddler to banish monsters will give them a lot more reassurance. There’s actually many ways you can do this. Firstly, you may want to try to introduce the idea of friendly monsters. There’s a lot of children’s books out there which help to build monsters up as a positive thing. So, look out for a friendly monster book and read it to your toddler before bed. You may find they actually start to like the idea of monsters after learning they can be friendly too. Another way to do it is to “scare” the monsters away. You can use your own imagination with this one. You could try something as simple as roaring like a dinosaur or making up your own little monster banishing rhyme. You could try a silly dance or simply telling the monsters to leave. Some parents like to get creative in their monster banishing techniques. Toddlers love the idea of magic, so why not tell them when they get into bed, an invisible shield forms around the bed, protecting them against monsters? This can also be a fantastic way to ensure your little one stays in their bed throughout the night. They’ll think as long as they stay in bed and go to sleep, they’ll be protected from anything lurking in the dark. Finally, you can also try a banishing box. All you need is a shoe box or any other type of box you can get hold of. Cut a hole into the top of the box and tell your toddler it’s there to trap monsters. Then, in the morning you can release the monster outside where they’ll run off to someplace else. As you can see, there’s plenty of monster banishing ideas you can try out and you may be surprised just how effective they can be. Showing your toddler fun things can happen in the dark too can help to ease their fears. Think about it, the only time your little one experiences the dark is at night when all is quiet. By showing them the dark can be fun sometimes, it can really help to ease their concerns. Some parents have come up with games they can play with their toddler in the dark which have helped to reduce their fears. Now, we’re not talking about playing in the pitch black here, but something as simple as throwing a sheet over both of your heads can really help. You can also start taking them on walks as the sun is setting. That way, they’ll get to see the day gradually becoming darker. It’s not as scary to see the gradual change as it is to go from light to dark. If the above tips don’t work, a night light could prove effective at helping your toddler fall asleep. They’re not expensive to run so you won’t need to worry about the expense if you’re on a tight budget. They also come in numerous designs such as animals and cartoon characters. Night lights are a fantastic investment and can make a massive difference to your toddler’s fear of the dark. It’s common to just cave in and let your toddler sleep with you. After all, you want them to feel safe and if they’re really upset and scared it’s only natural you’d want to bring them into bed with you. However, this may actually send your toddler a signal that they aren’t safe in their own room. So in essence, letting them sleep with you is going to make them less likely to want to sleep in their own room again. Go and comfort them, try out the tips above, but avoid letting them stay with you. Overall, a toddler’s fear of the dark is completely natural. The above tips should really help, but it’s worth noting some nights will be more difficult than others. It’s also a great idea to monitor what they see on TV and also avoid telling them scary things, even if you’re only doing so out of humor. The fear stage will pass so try to be patient and see it from your toddler’s point of view. A toddler is very imaginative. They think of all the different things one can ever think of. Even the swaying of the window curtain makes them really scared. I believe telling them ghost stories gives them this impression of seeing different images during the night. It is better if we just read them bedtime stories that can inspire them and has good values in its characters. TV sessions should also be monitored closely as it will have a great impact on them and on their sleeping habits. I agree ghost stories aren’t a thing for kids specially during bed time. Instead short stories of bravery, fantasy and learning could be very helpful. And you may also include promoting Santa Clause as this will guide them to do good in time for Christmas. I totally agree with you Katherine and jojo. Ghosts or scary stories should never be read to children because it would make them feel afraid. The scary images in their head could make their imagination go wild so that a curtain blown by the wind becomes a scary thing. Bedtime stories should be happy ones because kids tend to dream of it. Jojo is also correct about stories of bravery or good deeds. It’s a way to teach them values in life. Scaring kids is the most common thing a parent do so kids won’t misbehave. Probably true to me the same reason we tell them about Santa Claus if they stay good for the entire year. But wait I never thought that this could actually increase its fear of the dark and what is funny is that to ensure my kid does get scared I often violate tip no. 4. So after hearing this probably I would go for another strategy to discipline my kid. One way that they won’t be scared of the dark instead. Like promoting Santa whenever necessary rather than establishing monsters in their imagination. It’s sad that there are indeed parents who scare their kids to make them behave, not knowing that this could hugely affect their psychological well-being. I am just glad I never used such on my kids because I don’t want them to be afraid of the dark. However, I had the misfortune of hiring a nanny who did this to one of my kids so he is afraid of the dark until now that he’s already a teener. So please monitor your nannies if you have any because what they do and say to your child could have lifelong effects. However, my siblings later in time had some really hard time being in the dark. Step no 1 and 3 above did work out for them. It makes me laugh remembering how mum and dad went about it. Good article by the way. I wouldn’t consider you as odd, Rumu. I’m sure you are among the lucky ones whose parents didn’t use fear to instill discipline in you. And I would say your father’s job also made a lot of difference because you saw him as your defender against monsters. And it looks like you have parents who are very good storytellers because they were able to banish your siblings’ fear of the dark with their creative ways. This is true in the sense that most of the toddlers have fear of the dark. I must say that implementing the four tips especially that of buying some of those books about friendly monsters will go along way in helping banish those fears in them. I totally agree with you Henrywrites about portraying friendly monsters instead of scary ones. After all, kids are very imaginative so I’m sure it would not be difficult to condition their mind that monsters are actually good and friendly, not something to be scared of. This would give them a whole new perspective about monsters. This reminds me of the movie Monsters Inc., particularly the latter part of the movie when the monsters shifted from scaring to making children laugh instead. It did make a huge difference — energy from laughter is stronger than energy from fear. We are currently at this stage where our boy is scared of the dark. We have tried some different methods such as telling him that the monsters are “friendly” and things similar but it didn’t help. He constantly tried to get into the bed with us to the point that it just started happening every night. That’s when we went and bought one of those special night lights that puts little stars onto the ceiling. So now, when he goes to bed, we turn it on and he honestly falls asleep so smooth. It’s absolutely amazing! All kids are truly distinct, Jane. What works with some may not work with others (same thing with adults). Great to know the night light got rid of his fear of the dark. We do hope he totally conquers it soon! Dont ever tell horror stories when going to bed bec. Its hard for them to sleep at night. They could end up with nightmares . You totally nailed it, James. It is indeed highly likely kids would have nightmares if they go to bed scared because of horror stories. Parents, never ever let them watch horror movies or tell them horror stories at bedtime. They will never forget it! I think as kids grow older and they begin to be exposed to television and all other stuff they tend to be afraid of being alone and of being in the dark. I agree with having the night light for your kids. I have a cell phone that is just lying around the house it’s some outdated phone but it has a flashlight so I use this every night for my kids in their room, on top of that the battery does last very long. Something else I recommend is be careful what you let your kids watch especially when it comes to cartoons. Most of these cartoons these days have some really disturbing characters and scenes that can build fear in the child. That is true, darelle. That is why it’s very important for parents to monitor what their kids watch on TV. I say, be very vigilant. Cartoons do not equate to being “child-friendly” shows, not anymore. Most cartoons now show violence or nasty behaviors that are not suitable for kids because they could imitate them. I guess most of us in the world have experienced this kind of irrational fear back when we were still children. In my case, not seeing anything or anyone made really afraid but since I slept with my parents, whenever I would feel my moms hands, I would immediately feel better and a little more courageous. Parents have to be patient when teaching and guiding their child through this phase. This is a continuous process, not a one time thing, so it would really take a while before children can really get over their fear of the dark. You’re right, SirenOnFire. It would really take a lot of patience to help a child get rid of his/her fear. Parents should not scold a child if he/she is slow in conquering his/her “monsters”. It takes time and it is in your child’s best interest for you to patiently help him get rid of the fear. Very well said Elsa! Indeed parents should not scold their children because of having these irrational fears since it is a part of childhood and these are stages where parents need to be there for them in order to conquer their fears and acknowledge that there is actually nothing to fear about. Scolding them, shouting and being impatient to them would just actually make matters worse for both parents and children. I have personally tried the 3rd trick which you mentioned above. I bought radium lights in the shape of stars as well as moon. That greatly calmed my toddler down and help to them get a sound sleep without making abruptly waking up in between. Over a period of time, my toddler was able to sleep even without the use of these lights. The lights are a great way to accustom your toddler to the dark and help them sleep. I was very afraid of the dark back hen I was a kid because they make my imaginations go amok, and because of this, my parents bought those radium lights too and it sure did make me calm down. I guess as a parent, one has to be creative and really patient in helping his children to battle these fears and acknowledge that although for adults they may seem silly and stupid, to children they are very real. Good point there, SirenOnFire, about fears being very real for kids while adults think it’s silly. Parents or adults should put themselves in the child’s shoes because a child’s perspective is truly different from an adult. We should be very understanding about their fears and do our best to explain things to them. And you’re right – being creative is a must for parents. If you were not creative during your singlehood, you may find yourself creative now. Not only that, you also become an expert in a lot of things – you become an accountant, a nurse/doctor, a teacher, a cook, a cleaner, a psychologist, etc. etc. That is exactly what I mean! The way parents handle these kinds of situations with their kids, would not only affect the way children comprehend things, but also the understanding of how deep their parents actually love them. They are very vulnerable during this stage of their lives that however their moms and dads treat them would surely have a long term effect on them. I strongly agree with your point. Sometimes parents would use this shortcut in discipline to force their children to obey them, but they tend to neglect the real effect of this on the way their minds work. By doing this, they themselves are planting the seeds of fear and doubt inside the hearts and minds of their children,and they’re unable to see that many actually carry these even as they grow up. I have kids already, my youngest daughter is 8 years old and my little one is 5 years old. Both of them are afraid in the dark and most of the time I yelled at them because they scream so loud when lights out. My children loves to watch movies all the times and they are so brave enough staring with horror suspense films. Of course they need to deal with every daylight only. One best practice I shared them is singing whenever they cannot see any lights at all. Darkness for everyone is a challenge task and not all conquer enough their fear with it. I’m sure you now have a better understanding of their fear of the dark and how to handle it. Patience and creativity are the keys to solving their fear. It will not be gone overnight, but eventually, they will conquer it. You should also probably discourage them from viewing horror movies because I’m sure they contribute to more fears – they could dream of it or it can make their imagination go wild. When my daughter is around between 5-6 she always ask me why is there a nighttime? This is the age of so many questions “WHY”. I always tell her that the sun needs to rest and the moon and stars will take over in looking after the people and all GOD’S creation. I always give her positive answers. I also stick glow in the dark stars, moon and hearts in her room. But sometimes she also experiences bad dreams that makes her crying at night while sleeping. Patience and more patience in answering their queries would be a big help . Ambiance of the room, the comfort of the bed, and stuffed animals are factors as well to have our toddlers a good night sleep. My sister has feared the dark for more than 10 years. I think trying to removed the fear of darkness from little children is better because some grow up still having that fear. I also don’t like staying in darkness although I know I can survive in darkness. Children have wild imagination which can get worse when they grow up fearing the dark. Scary movies used to make me have nightmares and be afraid of the dark. I think toddlers should not be introduced to scary images so as to reduce their wild imaginations. True, jessym. Children should not be allowed to watch scary movies because they would think it’s real. Children are still gullible and think what they see on TV is real even if we tell them it’s just a story. That could be the source of fear in the dark so it should be a no-no. I never let my kids watch those horror/gore movies when they were young because I don’t want them to grow up fearing the dark. Thankfully, they are not afraid of the dark. Now that my boys are already teens, they can watch horror movies whenever they like. I imagine the easiest solution would be to provide a night life like you mentioned. As it is, I usually leave the hallway lights on at night, though this has little to do with fear of the dark and all to do with trying not to stumble around in the dark when waking up in the middle of the night to use the bathroom. Yes, a night light would work just fine to cast away the darkness. Children do have very active imagination and could conjure creatures lurking in the dark. With the hallway lights on, you’re solving two problems at once. Good job! We sleep with the lights on. When lights are on, it is easier to check the baby, whether he has soiled the diapers or has wetted his clothes from sweat. Due to this, the baby finds easier to sleep when lights are one. When the lights are switched off, the baby will start crying. I think he will grow into a toddler that will be afraid of the dark. However, this is just an assumption. You’re right – with the lights on, it’s easier to check on the baby. We do hope you could still make use of these tips so he will grow up unafraid of the dark. You still have a lot of time to work on it 🙂 Best of luck to you! The mind plays a major role in a child being afraid of the dark and it’s what’s fed to the mind that processes and give the kid frightening experience anytime it’s dark. Avoid allowing them to watch any movie that contains elements of horror because it’s like to scare them in dark setting and always have the lights in their room on even though it would make them not sleep early.